An outstanding mix of people, vibrant culture, age-old traditions and diverse landscapes – India is all this and a lot more. Regardless of what part of the world or background you come from, you'll find India truly amazing. On the one hand, the historical monuments of Delhi and Agra tell the glorious saga of the Mughal Empire. On the other hand, the exquisite forts and palaces of Rajasthan remind you of the splendid times of the Rajput kings. For an altogether different experience, you can head straight to Goa where life is plenty of fun and adventure. Aptly termed as the 'Beach Capital of India', Goa is a regular haunt of adventure and beach lovers. 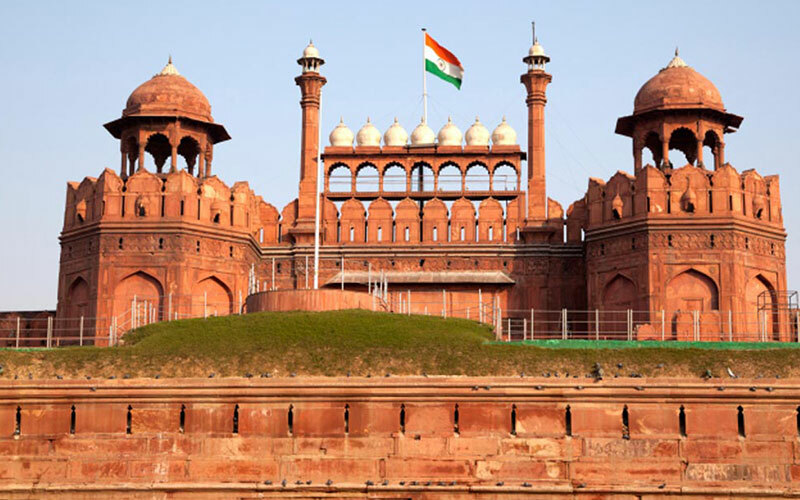 Start your 'Romance of India' tour with a full day of sightseeing in Delhi. Old and New Delhi are the two sides of a coin. Old Delhi, founded by Mughal emperor Shah Jahan, is redolent with lots of historical buildings belonging to the Mughal Era. New Delhi, on the other hand, is a fine example of modernity. Drive to Agra, the 'City of Taj', while visiting Fatehpur Sikri en route. After exploring multiple attractions of the Mughal era in Agra, head for Jaipur, the 'Pink City'. Jaipur is visited for such popular attractions as the Amber Fort, Hawa Mahal, Jantar Mantar etc. Later, drive to Jodhpur, a famous desert city, for more sightseeing and adventure. After exploring Udaipur, fly to Mumbai, the 'Financial Capital of India'. In Mumbai, visit the Elephanta Caves (a UNESCO World Heritage Site) and the Gateway of India. Next, fly to Goa where you'll have plenty of time to have fun on the pristine sandy beaches and visit multiple tourist attractions. Finally, get back to Mumbai for your onward journey or returning home. Upon arrival at Delhi airport you will be received by the representative of the Company. After traditional welcome you will be escorted to your hotel for a comfortable night stay. Sightseeing tour of Delhi is lined up in today’s schedule. Get up, have your breakfast and meet with your guide in the lobby of your hotel to start the tour. We start the day trip from Old Delhi where we visit India’s largest mosque Jama Masjid and the crowded Chandni Chowk (silver street) which is considered to be the market place of the Mughals. Enjoy a cycle rickshaw ride in the busy streets of Chandni Chowk for a real Indian experience. From here proceed to visit Raj Ghat, the cremation ground for Mahatma Gandhi, the father of nation. Take a drive through the beautiful buildings and area of British time. Visit India Gate, President’s Palace, Parliament Building. You may ask your guide to suggest some good restaurant near the city centre where you can have delicisou food of your choice. Later visit Humayun’s Tomb, Qutub Minar and Bahai’s Temple (Lotus Temple). Drive back to your hotel for night stay. Following breakfast, we will drive to Agra. 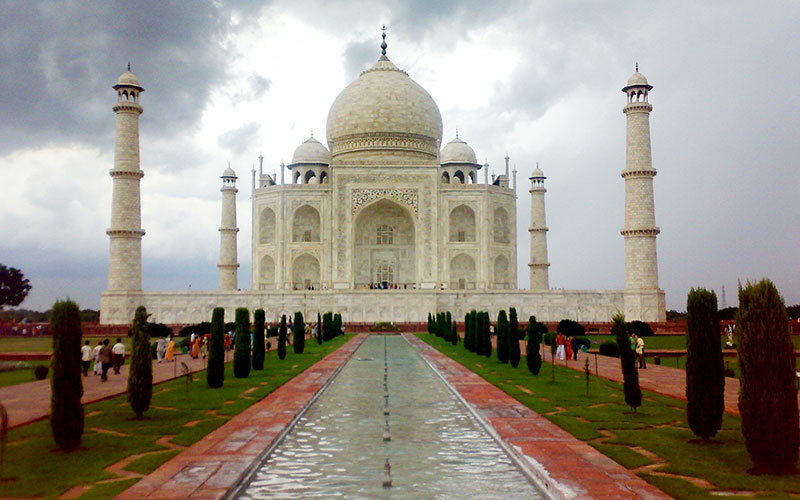 On reaching Agra check into the hotel and go for a sightseeing tour of the city. Agra sightseeing tour will include a visit to massive red sandstone structure of Agra Fort which was built in 1566 by Mughal Emperor Akbar, the tomb of Itmad Ud Daulah which is situated on the left bank of river Yamuna. In the evening visit the gorgeous Taj Mahal during sunset. The unparalleled beauty of this white marble structure comes alive during sunrise and sunset when it changes its colour according to the sunlight. Taj Mahal was built by Mughal Emperor Shah Jahan for his wife Mumtaj Mahal who died while giving birth to his 14th child. Come back to your hotel later for night stay. Leisurely morning in the hotel and after breakfast start driving towards Jaipur at around 9 AM. If you wish to arrange a morning visit to Taj Mahal, during sunrise, you can inform the office and the guide a day prior. The visit will be arranged subject to availability and cost. While driving towards Jaipur, just 30 kms out of Agra town we stop at the deserted city of Fatehpur Sikri. Once the citadel of Mughals today this beautifully designed and excellently planned city is standing alone telling the stories of great Mughal Empire to the visitor. Mughals had to shift thier capital later to Agra due to acute shortage of water in Fatehpur Sikri. Later proceed to Jaipur and on arrival check-in at the hotel. Post lunch take an excursion to Amer Fort which is 11 kms out of Jaipur city. Ascend to the fort on Elephant’s back in a royal style through the traditional way from the erstwhile Kings used to reach thier capital on Elphants and horses . If you do not wish to ride on an Elephant there are ordinary jeeps also available to take the travelers to the top of the hill. Visit the fort and then come back to hotel for leisurely stay. After breakfast start sightseeing tour of Jaipur city with your guide. Jaipur is the capital of the royal state of Rajasthan and is also known to travelers as ‘Pink city’ for its pink coloured buildings, shops and houses in the old part. The major tourist sites to be visited today are Hawa Mahal (Palace of Winds), Jantar Mantar Observatory and City Palace Museum. In the afternoon visit the colourful markets of Jaipur by walk or on a cycle rickshaw for a firsthand experience of the lifestyle of local people. In the evening prepare yourself for a delicious dinner in a local city restaurant where you may also get a chance to witness live folk dance performances by local artists dressed up in typical Rajasthani style. After breakfast drive to Pushkar, the holy city of Hindus. At Pushkar visit the Pushkar Lake and temples. Enjoy a short camel cart ride or camel ride in the village of Pushkar before continuing drive to Jodhpur. Arrive Jodhpur in the Afternoon and check in at the hotel. 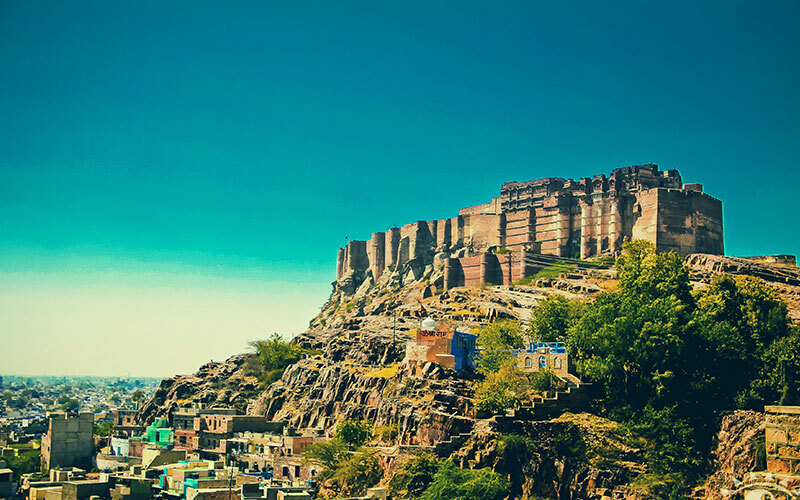 Later take a trip to Mehrangarh Fort and walk in the old market near Clock Tower. Night stay in the hotel. After breakfast visit the imposing marble memorial of Jaswant Thada. Drive past through the beautiful Umaid Bhawan Palace. Later check out from the hotel and drive to Udaipur. On the way to Udaipur stop at Ranakpur to visit the beautiful group of Jain Temples. Built in the 15th century the temples of Ranakpur are built in white marble in the lovely Aravali hills. Guides are not allowed inside the complex but Audio guide option is available at the ticket counter. Continue drive to Udaipur after completing the tour of Ranakpur temples. 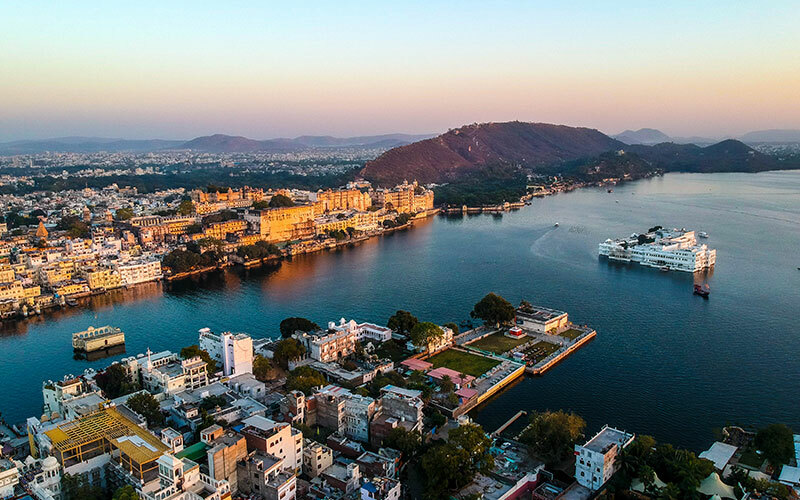 Relaxed stay in Udaipur to explore the natural and historical beauty of the town. This morning we will explore the prominent tourist sites of Udaipur. Start the day with a visit to Jagdish Temple. Visit the temple during the moring prayer if you wish to get a real feel of it. Later drive to City Palace Museum which is a architectural marvel of Rajasthan, Sahelion Ki Bari (Garden of the Maids), Drive through the beautiful Fateh Sagar Lake and also visit Vintage Car Gallery. In the evening take a boat trip on Lake Pichola to capture some beautiful memories and pictures of scenic beauty of Lake Pichola. Travel through the lake and reach Jag Mandir Island where you can disembark to spend some time on your own. Return to the mainland of Udaipur and participate in ‘Light & Sound Show’ which takes place in the City Palace during the winter tourist period (September to April). Night stay will be in your hotel. After breakfast fly to Mumbai. The most advanced and fastest growing city of India. Facing the Arabian Sea the city of Mumbai is known for its energetic lifestyle, historical sites, sea ports and Bollywood. On reaching Mumbai transfer to your hotel where you keep your luggage in your room and come out immediately for a sightseeing tour of Mumbai. We will visit many heritage sites which reminds us of the British Raj in India. Start the tour from Prince of Wales Museum and continue to Hanging Gardens, Marine Drive, Chowpati Beach, Victoria Terminus and Dhobi Ghat. In the evening transfer to your hotel for stay. Elephanta Island is situated 10 kms from Mumbai port in the middle of the harbour. It is famous for spectacular rock cut temples and caves which are now listed among UNESCO World Heritage Sites. The beautiful caves and temples can be explored by an easy one hour walk on the Island. Once you reach the Island you have to walk for about 500 mtrs or one can enjoy riding on short ride on a toy train. Come back to the mainland of Mumbai and visit the Gateway of India. Located on the waterfront in the Southern parts of Mumbai, this arch shaped structure was erected by British Govt to commemorate the arrival of King George V and Queen Mary who visited India in 1911. Rest of the time free to explore Mumbai on your own Or optional tours of Bollywood, Dabbawala, Dharavi Slum etc can be selected from the list at additional expenses. After breakfast, we are not moving to the most beautiful beach destination of Goa. White sands, sunny beaches, swaying palm trees, sparkling water make Goa a very famous beach holiday destination in India. Goa attracts more than two million visitors every year from around the globe. Candolim Beach, Calangute Beach, Anjuna Beach,, Baga Beach, Vagator Beach, Colva Beach, Palolem Beach, Aramol Beach, Miramar, Dona Paula and there are many other beaches in Goa to make this smallest state of India the biggest tourist destination of the country. Arrive Goa airport and get transferred to your beach resort for leisurely day and night stay. A half day tour to Old Goa is will be a delightful experience to cherish. 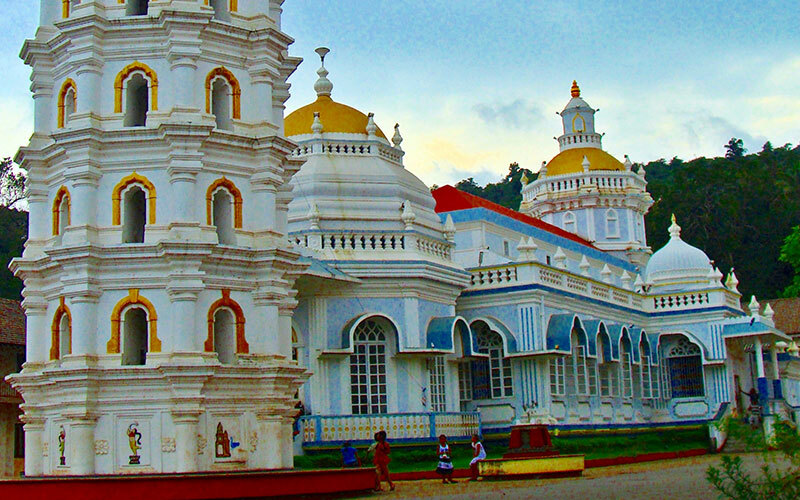 Visit the important tourist sites including Dauna Paula, Panjim, Basilica de Bom Jesus, Se Cathedral Church and Mangeshi Temple. An evening cruise on Mandovi river can add spice to your visit. Ask our experts to organize it for you as advance bookings are required to be sure to get entry during the peak hours. Day is free to relax on the beautiful beach. Stay at the resort.